I’m a big fan of dark and gritty fantasy and have been for some time. I guess it started with my foray into A Song of Ice and Fire years ago and continued one with authors such as Joe Abercrombie, Steven Erikson, R. Scott Bakker, Mark Lawrence, Richard K. Morgan, and others. However, as of late I’m starting to lean more towards wanting to “spread my reading wings” so to speak and get more on a comic tip. Meaning I want to explore some of the quirkier fantasy that exists out there. 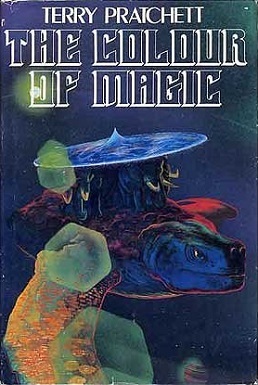 I love the idea of Terry Pratchett’s Discworld books, but the only one I’ve read The Colour of Magic hasn’t clicked with me. I would like to give it another try for sure though. I’m told that I should try others in the series, and I fully plan on doing so at some point. I’d say he’s probably the father of quirky kind of fantasy, so I’d really like to give him an honest shot. I do love his style a lot. It’s playful, doesn’t take itself too seriously, yet is still quite engaging. Other writers I’d like to explore more of is the New Weird lot. China Mieville is the only one I’ve read and is work goes beyond quirky. It’s just weird in a good way. Like “How the hell did he think of this?” His style is also highly engaging and I recommend him to anyone looking for something a bit different. I feel like there is about to be a drastic shift in fantasy away from the darker stuff and more into lighter fare. Brandon Sanderson’s latest book being number 1 on the New York Times Bestsellers’ List. may be an indicating of such. Sanderson’s writing is not very dark in my estimation, so we may see more writers going for a more traditional approach. However, Sanderson has one edge: his inventive worlds and magic systems. His characters are also very interesting as well. So what are some weird, quirky books that caught your attention? Please share!